In the valley of the river in the German province Eltsbah Rhineland-Pfalz , other than incredibly beautiful natural scenery, you can see magnificent historical monuments. One such castle is Pyrmont, which is located in famous for its natural beauty area Eifel. 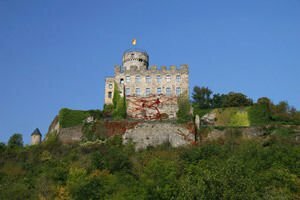 This German territory is locked between the cities of Aachen, Cologne, Koblenz and Trier and is known mostly for Eifel Nature Park, which extends over a 110 sq. km area rich in lakes, forests, meadows. Pyrmont Castle is located near the recently renovated Vianden Castle. Pyrmont Castle is an intriguing medieval fortification, which is located only 50-something miles from Air Base Spangdahlem. The walk to the castle Pyrmont guarantees you great and memorable moments in the history of the region, combined with the scenic beauty of the Eifel region. The castle itself is located in the river valley, but dominates the surrounding area from its hilltop, shrouded in dense forests. The first historical castle Pyrmont was dating from 1225. Today the oldest parts of the structure area 82 feet tall Romanesque tower that is distinctive for Pyrmont and which overlooks the field Maifeld. The next oldest part of the fortress was the original chapel of the castle, which dates from the 15th century. In the early 18 th century Pyrmont undergoes transformation and becomes a beautiful baroque palace. The year is 1710, a century later the castle was abandoned by the Frenchmen who own it. Palace Pyrmont springs to life when in 1960 it was completely rebuilt and reconstructed by the two architects Hentrich and Petschnigg. Today, the castle walk of Pyrmont is a unique experience. During the tourist tour, visitors have the opportunity to see the Hunting Room, Choir, Knight's Hall, an interesting kitchen premises where once was kept arsenal, and many other rooms. On the first floor of Pyrmont, we can see a tapestry, which dates from the 16th century. Here is an iron door, behind which the centuries have been hiding the priceless treasures of the castle. At the Pyrmont Castle, one can view unique antiques, such as the smallest bible in the world. Among the authentically recreated parts of the interior of the palace is the fireplace, which has been modeled on that of the 15 century. In the Hunting Room of the castle is set a collection of different and unique and ancient weapons facilities for fishing and hunting. The walls can be seen bows left over from the former owners of Pyrmont - family Waldbott von Bassenheim. Be sure to examine the original chapel and the castle. It was built of stone blocks, as is observed in the French style decoration. In the chapel you can see one piece of the Holy Bishop, which is a testament of family Krause. They call for the bishop patron of Pyrmont Castle. Today, at the Pyrmont Castle are provided all the necessary amenities for visitors. At the palace there is a cafe and restaurant offering a wide variety of foods, snacks, sweets and ice cream. The pleasure is complete, because customers are served by waiters dressed in authentic medieval clothes.